Posted April 10, 2018 by Josette Farrell in Sport. Weekly Sellers Prize: Shaun Killilea. €2.00 per panel or 3 panels for €5.00. Win or share €200 for match three. Last draw was in Egan’s Bar on Monday 9th April. Well done to the Galway Senior ladies who defeated Westmeath on Sunday in the Final round of NL and will play Dublin in the semi-final in two weeks. Well done to the Galway Minor Ladies who defeated Mayo on Saturday to reach the Connaught Final. Our Junior ladies were in league action on Sunday morning with St Mary’s. The visitors lead at half time 3-8 to 3-3. A great second half effort from Claregalway saw the Girls draw level but a late rally saw St Mary’s win 5-14 to 5-9. Next up for the Juniors is at home to Caherlistrane next Sunday. On next Friday night at 8:30 the Seniors will host Annaghdown in Round three of the Division 1 league. 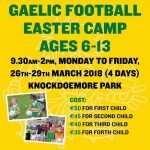 On Saturday 14th April sees the start of the Gaelic4Girls commencing from 3-4pm Knockdoemore Pitch. Gaelic4Girls is initially an 8 week programme aimed at increasing participation in by girls to Ladies Gaelic Football. The programme is open to girls aged between 8-12 years who are not currently registered with a Ladies Gaelic Football Club. All are welcome and can registrar on the day. The cost for the entire programme is €10 with every girl receiving a jersey. For more information contact Lorna McNicholas 0872873538. Well done to the u12 Girls who took part in the National Blitz in Croke Park on Bank Holiday Monday. The senior men’s team have their next Div 2 match of the league at home in Lakeview against Moycullen. The match is fixed for 2pm this Sunday. All support welcome. The U16 Boys are at home in Knockdoemore next Tuesday at 7pm against St James’ while the minor footballers are away to Athenry in the North Minor A League next Wednesday at 7pm.